In the last week of February, Maslenitsa is traditionally celebrated in Russia. In Shrovetide festivities take part everything from small to large. Broad Maslenitsa is a national holiday, celebrating it colorfully and riotically with songs, round dances, contests and burning Shrovetide stuffed. This is exactly the Maslenitsa shown in the picture of Kustodiev. I have not yet had time to melt the snow, the trees are covered with hoarfrost and frost, but the people gathered around the bright sheds are not cold at all. The fair is in full swing, carefully looking at the canvas it is possible to notice the main characters of Shrovetide festivals – buffoon, Petrushka, devils. The less wealthy people arrived at the fair on their own two feet, the young ladies and gentlemen with the means – in smart sleighs pulled by several pairs of horses. The snow-capped peaks of the trees cannot hide the brightness of the posters and signs offering various kinds of entertainment to travelers. The multicolored crowd is ready to start eating pancakes, drinking mead and watching the action unfolding under the canopy of the street theater. When writing paintings used bright, rich colors, allowing you to fully convey the fun that engulfed the crowd. The picture was not written from life. The year of its creation is considered to be 1917. In February of this year, cannons thundered in Moscow, St. Petersburg and other large and small cities of the country, blood flowed, fires blazed. The bright picture is just a memory of a past peaceful and quiet life, a kind of regret for lost calm. 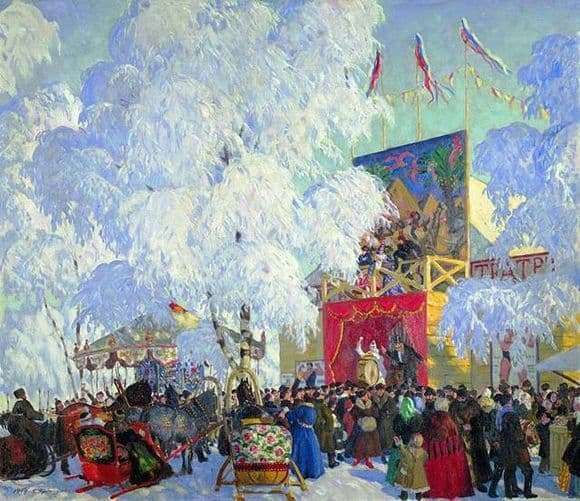 In 1917, Maslenitsa was almost never celebrated and only the beauty of the picture created by Kustodiyev reminds people that life goes on and not everything is lost in it. The canvas is stored in the Russian Museum. The size of the picture is just over 1 meter; it is painted on canvas using oil paints.